You will have the waterfalls all to yourself! The hike is moderately strenuous and extremely fun! Scale a 10 foot wall to the waterfalls! On the Kalihiwai Falls Hike you will discover spectacular waterfalls on Kauai. Explore all five tiers of the falls, and you will also experience beautiful terrain on their pristine private ranch. This is the only tour on island that gives you access to the top of Pu’u O’ Henui (a 500-foot gain). You will enjoy stunning panoramic views of the entire north shore. 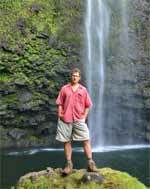 Next, hike the lowland rainforest, while learning about Kauai’s history, flora and fauna. Then descend a ten-foot rock wall to Kalihiwai Falls. 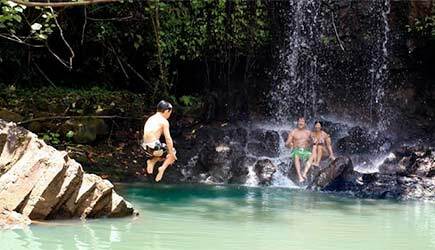 Enjoy this 80-foot waterfall all to yourself for swimming and relaxing with a delicious picnic! The hike continues up the valley along several streams. The hiking times is 3 hours, and the hiking distance is approximately 4 miles across varied terrain. The hike is rated moderately strenuous, because it includes rough hewn stairs, multiple stream crossings plus climbing up and down a ten-foot rock wall. Schedule: Monday, Wednesday, Friday, and Saturday at 9am. Reservations: When you reserve the Princeville Ranch Jungle Valley Adventure on our website your reservation will be guaranteed on your credit card. For most parties a 20% deposit will be charged just a few days before you leave home for Hawaii. The balance is paid when you check in for your tour. FOR PARTIES OF 6 or MORE the 20% deposit and the 80% balance are charged when your reservation is made. Directions: One mile north of the Princeville Airport, on the ocean side of Kuhio Highway (Highway 56). Look for the green and yellow flags and the circular “Princeville Ranch Adventures” signs. Tour includes: Picnic lunch. Please let us know if anyone in your party prefers a vegetarian or gluten free meal when making a reservation. Restrictions: Minimum age for this tour is 5. Children ages 5 to 15 years old must be accompanied by an adult guest who is at least 18 years old. Children aged 16 and 17 years old may tour without an adult. No neck or back injuries or pregnant women. All participants must be in good physical condition. No pregnant mothers, and no recent injuries or surgeries. Moderate hiking is involved. Requirements: Close-toed shoes are required (sneakers, hiking boots, hard-toed sandals). No “5-finger” toe shoes, aqua socks or Crocs allowed. All-terrain, hard-toe trail sandals can be rented at $5 a pair if you don’t want to get your shoes wet and muddy. What to Bring & Wear: Light and comfy active wear and a swimsuit beneath your clothes. Sneakers or hard-toed hiking sandals. Sunscreen, sunglasses & hat, towel, bug repellent, and drinking water. Backpacks can be rented for $5. Cancellation Policy: Cancellations must be made at least 48 hours before for 1-5 guests. 72 hours notice for 6 or more guests. Note: Kalihiwai Falls Hike goes out rain or shine. In the event Princeville Ranch determines the conditions to be unsafe, guests will be rescheduled or provided a full refund prior to the tour. 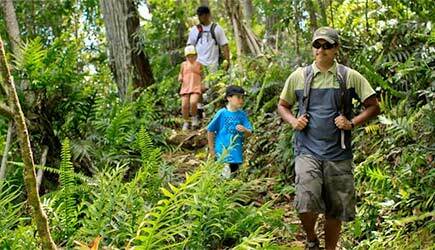 The Kalihiwai Falls Hike is available for NCL passengers who are staying overnight on Kauai. 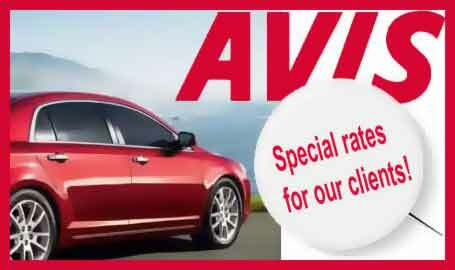 It is on the north shore of Kauai and you definitely need a rental car (the drive is about an hour). It is an easy, scenic drive and the tour is well worth the effort.